This class is about exploration and creating surface designs. The idea behind the class is to show how inspiration can become a pattern. The workshop is a collaborative effort: we will all explore and learn together. We will use our eyes to seek, our hands to create, and our heads to design three surface patterns on paper for whatever application you want. We will find inspiration in our Shakerag environment and investigate this source through line, color, texture, scale, materials, and manipulation. 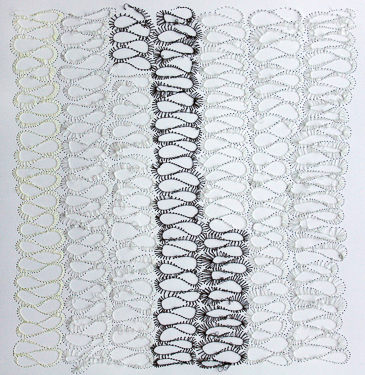 By studying motifs, grounds, textures, and repeats, our patterns will evolve. We will hone our studies by focusing on composition and color. The group will review and discuss the design process employed throughout the week. We will conclude with possible directions and applications for the work created. At 50, I decided to return to school. With extensive experience in textiles, design, art, and architecture, I had always dreamed of designing printed textiles for apparel. Since the early 1960’s, when I discovered Design Research in Harvard Square, I envisioned creating design for the everyday. My mother, in whose memory I created my business, instilled in me a critical eye, respect for the highest quality, strict pragmatism, an appreciation of fine fabrics, and imaginative descriptions of color. 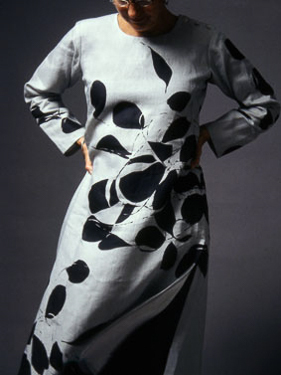 Working toward an MFA in Textiles at RISD, I was influenced by the work of Vuokko Nuresniemi for Marimekko, Metsovaara, Vera, and Jack Lenor Larsen. I was introduced to the art and craft of experimental silk-screen on a range of surfaces, and loved the immediacy of the medium. During my years at RISD, I concentrated on textile design for print to be used for beautiful yet practical everyday apparel. I worked to create textiles that were conceived by simply stopping, looking closely, and finding beauty and significance in the mundane. By envisioning simple functional flexible garments on the human body, I engineer the designs to move across and around the garment. Front and back relate to each other, sleeves relate to the body, and hem relates to the shoulder. The design moves across the body and undulates with the body. After graduation in 2001, I moved to New York and started my business in my second bedroom (2002). It took two years to find and work with a supplier for Belgian linen, a textile printer, a pattern maker, a fit model, a pattern grader, and a garment maker (of excellent quality) to get more than one finished garment on the street! In 2005, I had my first show in a friend’s living room. Since then, I have exhibited and sold my garments at high-end craft shows. My decision to return to school provided the direction and foundation for my work, and my dream continues to fuel it.